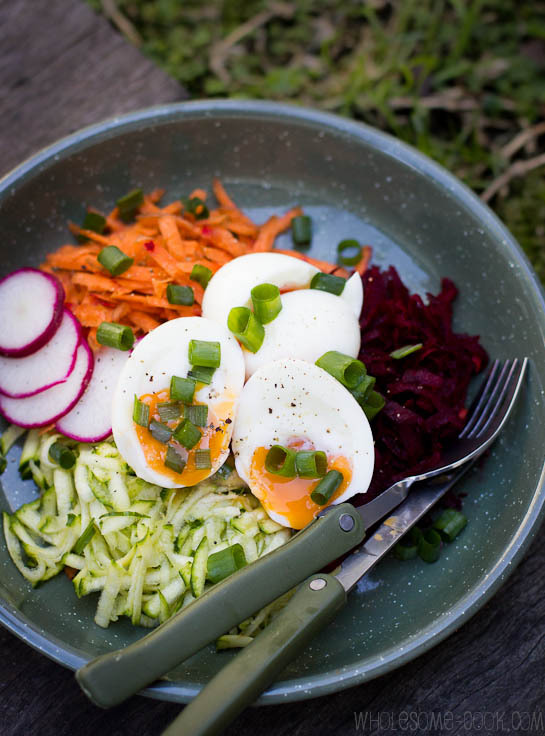 This Beetroot Zucchini and Carrot Salad with Runny Eggs makes for a great warm weather lunch or dinner dish, drizzled with a macadamia oil and fish sauce dressing. Fried eggs, or falafel for a vegetarian version (with soy instead of fish sauce) would go well in this too. Last weekend we headed up to Brisbane for a special weekend do: three generations of boys were off to do some canoeing and camping near the Maroon Dam! The plan for the girls was to unwind over some home-grown food and meet Aunty K’s new puppy, Mala, and her four chickens. 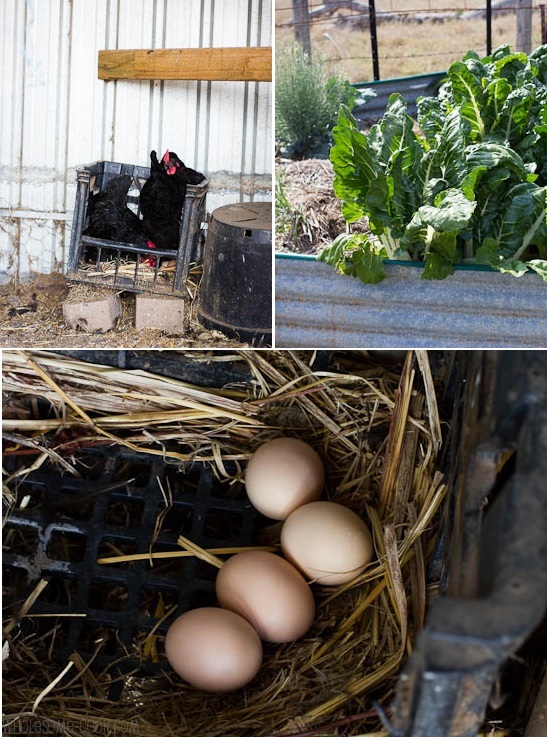 After picking some fresh eggs from the chookhouse and a quick kitchen garden lesson for the little girl, we sent the men off to do their “secret mens’ business” in the bush. 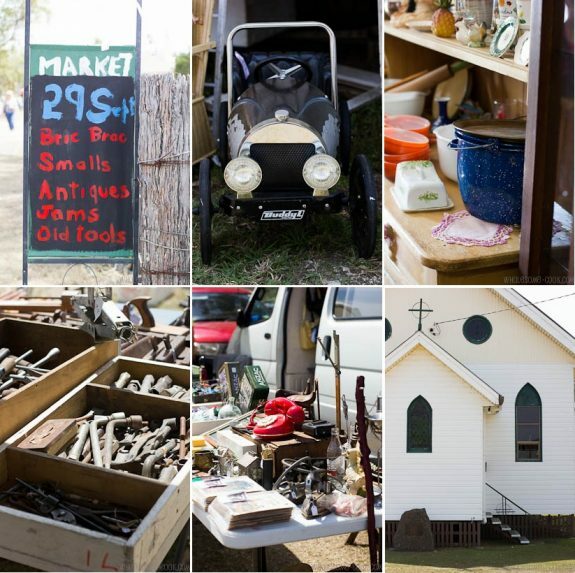 Luck had it that, as we were driving through a small town of Peak Crossing to get to Boonah, I spotted a Car Boot Antique Sale sign and was keen to investigate things further. Since we needed to pick up some bits and pieces from town for our foodie weekend, we got back in the car and headed to see what goodies were on offer at the market as well. After paying a $2 entry fee (for adults, kids’ entry was free), we were in! Now that’s what I call a cool market. The Peak Crossing Market offers a wide range of wares: vintage toys, old tools, homemade jams and preserves, furniture, collectables and, this I was most excited about, lots and lots of old kitchenwares! We wandered about, picked up a few things for the girl’s scrapboook and what I refer to as the buy of the century: $1 for this lot of three old pie tins, a brass tray and three silver-plated forks. I mean, I’ve seen those trays on eBay for £17! Yes, pounds. I also managed to snap up this lot of old chemist’s flasks and three vintage locally-made lemonade bottles. As we traveled light, Derek – the stallholder, a friendly old chap, offered to wrap all of them up and send them to me by post. He even included a couple of mini flasks as a thanks for me being so trusting, how is that for great service! Carrying as much as our overnight bags would allow, we headed back to Boonah, where K took us to her favourite coffee-bookshop, The Story Tree (74 High Street, Boonah). Now, for a small town that place is as good as I’ve seen here in the big smoke. Owners Matt and Rachel have thought of every little detail. The shop stocks all of the great cookbooks you’d normally expect to find in a quality bookstore, it has a fantastic play area for the kids at the back and plenty of quirky vintage-inspired space for the adults to unwind with their cuppa. There are lounges, and tables, and even tree-stump seats. There are books to be read and magazines to be flicked through. There is even a room reserved for promoting other small businesses in the area with The Vintage Project currently showcasing their gorgeous recycled wares. It is rustic, fun and very cosy. A must-see when in Boonah for sure! 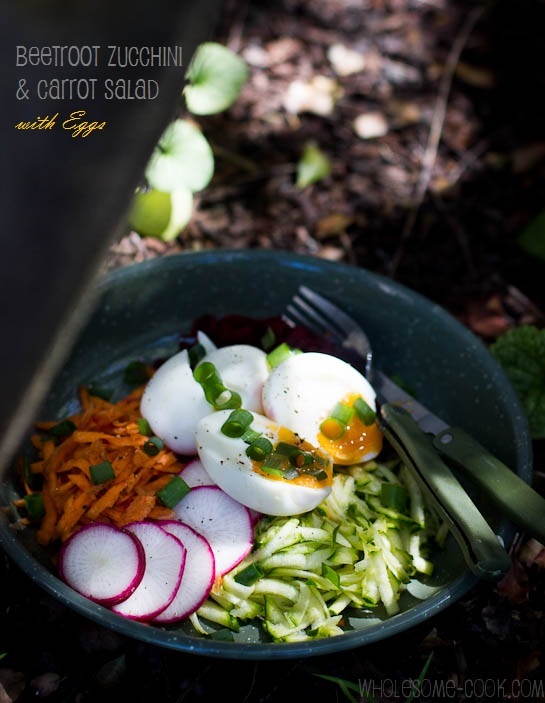 The next morning as we were enjoying those freshly-laid eggs for breakfast I began to wonder if I could take some of them home to Sydney, too… I gave up on that idea pretty quickly, but it inspired me to pick up some fresh organic eggs on our arrival and make this raw garden salad to go with them. It’s really quick and tasty and reminds me of the time we had last weekend – in fact, I found the recipe while flicking through the Australian Good Taste magazine at The Story Tree. So, tell me, what or whom have you been inspired by recently? Olive oil can be substituted for macadamia nut oil. For a vegetarian version use, 1 tablespoon of lemon juice instead of fish sauce. Fried eggs go as well in this as soft-boiled ones. Place cold eggs in a saucepan and cover with cold water. Place on the stove and cook for exactly 3 minutes from the moment first bubbles begin to appear on the surface of the water. Drain and cool under cold running water for a couple of minutes. Peel and set aside. Grate beetroot, zucchini and carrot on a coarse side of the grater. Whisk dressing ingredients in a small bowl or jar until sugar has dissolved. Drizzle dressing all over grated vegetables. Add eggs and sprinkle with some chopped chives or spring onion. Hi there, I only just found your blog recently and I just wanted to say I really like this post. Travel and food go hand in hand and you’ve captured it beautifully in your photos and words. I hope you keep doing more travel posts with recipes. Now I feel inspired to start my own veg garden too! Wow! $1 for all those things, how lucky was that you found this place. 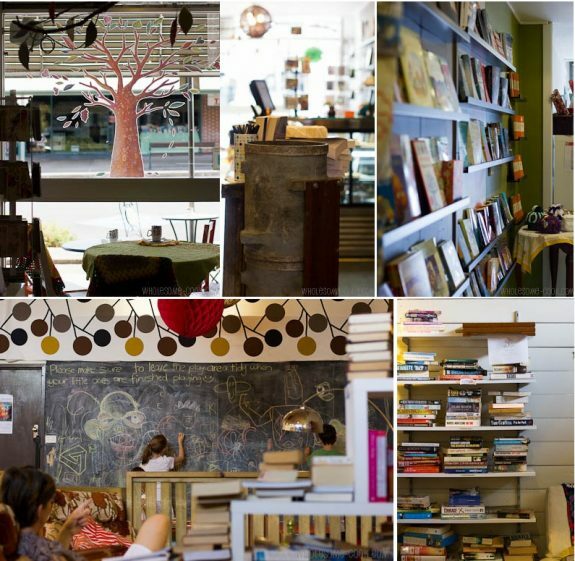 Thanks for the tip about the bookshop too, must check out next time we head up to Brissy. Sounds worth the drive. Gorgeous salad! And what a jackpot for props! Lovely salad and what an adventure!!! 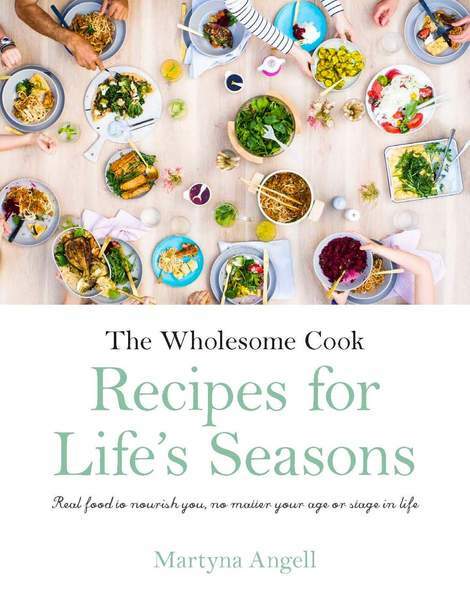 Love the dressing and the fact you have included beetroot: one salad vegetable I so oft ‘forget’! And do wish I had been with you on that productive amble 🙂 ! Hi Eha, I actually don’t include beetroot enough either but I was all out of salad leaves and tomatoes so they became the perfect match. What great finds! That’s what I love about visiting regional markets and stores. Things aren’t as picked over as they are in the city 🙂 Love the vintage bottles-I can see them being used for Halloween! Exactly what I thought! It was quite amazing actually – I saw some fabulous chairs too, but unlike little bits and bobs, they would have been much harder to transport back home. Beautiful and so appetising salad! I love soft boiled eggs and zucchini is one of my favourite vegetables. I also like it raw. I have really enjoyed reading your post today. Very interesting. Thank you Sissi, to be honest I have only recently discovered how delightful raw zucchini really is. I felt inspired by your post and made this for dinner last night and it was so simple and delicious. Perfect on a hot day. Thanks for the idea. Sounds like you had a lovely family weekend and gosh those market finds are fantastic. Great summer salad too. 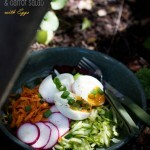 This is an ideal salad for the warm weather we’ve been getting lately. I love salads like these! On a side note, it was nice to hear you getting around the markets in Ipswich and Boonah. We used to go swimming in Maroon dam when I was a young teen! As always you have a gorgeous presentation! I love vintage things and find that beautiful. I wish I know a place like this here then I’d be going frequently!